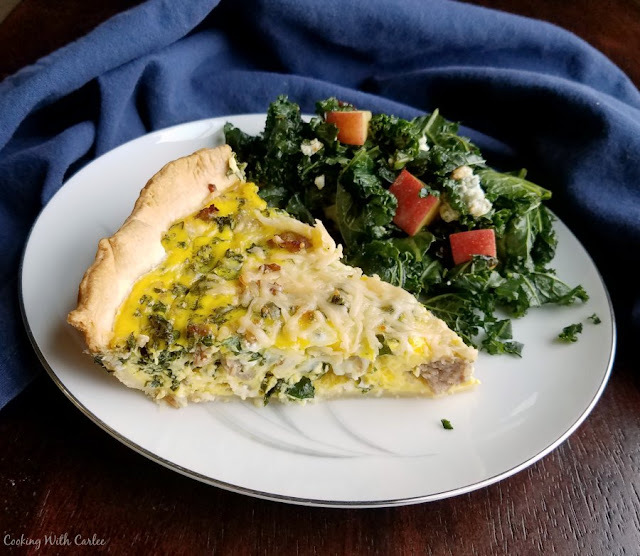 Simple but flavorful, the sausage and kale quiche is a perfect breakfast, brunch or easy dinner. I have been getting weekly bunches of kale delivered in my CSA boxes. We have been enjoying it in salads like the lemon and chickpea kale salad, we've had it in fruity bleu cheese salads, in soups and more. We have been loving it all, but I want to keep it fresh so we aren't eating the same kinds of dishes over and over. That is when I remembered this quiche recipe. It has been a few years since I made it and I thought it would be fun to revisit it. Plus it was a great way to to not burn my husband out on salads! I am so glad we revisited it. My husband isn't usually a big fan of breakfast food for dinner. He will tolerate it, but isn't ever going to request it. He ate a couple of slices dutifully, but I expected to have the leftovers to myself. I was wrong. He ate the rest of it himself! I'd say that was an endorsement. I have been in the mood for Zopa lately. 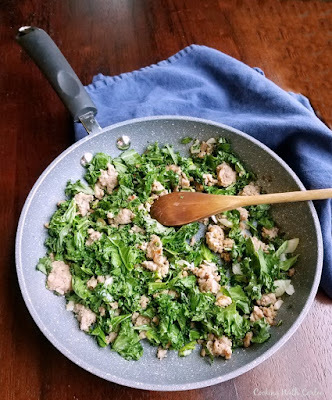 There is just something about the sausage and kale that just good so good together. But, when I make soup... I make a big pot. Sometimes it is hard to stop! I pull out a big pot and start with my intended ingredients. Then I add a little something else. Maybe a bit of this and some of that. Next thing I know the pot is full. If there is room, I keep adding! So, I decided to take the flavors I love and make a quiche. There is less room for it to grow! I used hot Italian sausage, but you could use sweet. Or feel free to use breakfast sausage, that would be good too! Matt went back for thirds, so that is a good sign. It really hit the spot! It made an excellent dinner, but would be a really nice option for a brunch as well. Brown the sausage, drain if there is excessive grease. Add diced onion and sliced mushrooms (if using) and allow to brown. Add kale and cook until it begins to wilt and soften. Turn off heat. In a separate bowl, whisk together the eggs and milk. Get crust ready in a deep dish pie plate. Stir mozzarella into kale mixture and spread over crust. Pour egg mixture over the kale. Bake at 375 F for 30 minutes. Top with Parmesan and continue to bake for another 10-15 minutes. The quiche should be set except for the very center which should still have a slight jiggle. 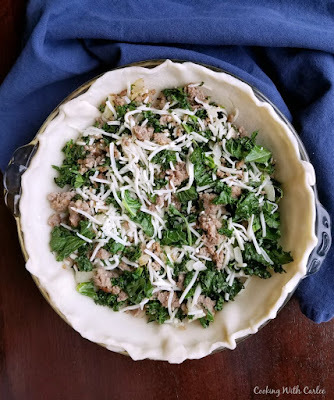 Your Sausage, Kale and Mushroom quiche sounds like a melt in your mouth weekend dish. Thank you for sharing with the Clever Chicks Blog Hop! I hope you’ll join us again next week! Thanks for hosting! It was so good, it is tempting to make another one already! Isn't it so good?! Thanks for hosting, see you Monday! Me too! Thanks for hosting. I love a good quiche. I've never had kale before, but it looks good! It is really good. It would be good with spinach too. Kale is a stronger flavored green, but you can blanch first to take it down a notch if you'd like. Thank you! It's a favorite of mine too! 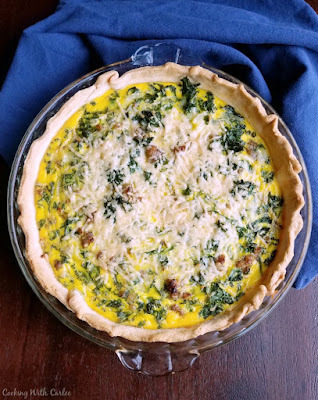 I was just thinking recently that I need to make quiche again soon, they're great for lunchtime (and we often pack for picnics). Looks great. I agree! More quiche is always a good thing! What a great idea. someone just gave me a ton of veggies. Quiche would be perfect. Going to have share this recipe with my brother - his garden is overflowing with kale right now! My brother is in the same circumstance! You are welcome at ours any time! I've wanted something different lately and I think this is exactly what I need to make! I love the "silent" endorsement from your husband. I've gotten those on occasion too. The quiche looks delicious. You take what you can get sometimes! I'll have to sub spinach for the kale but I see this on an easy weeknight dinner soon. I LOVE quiche!! 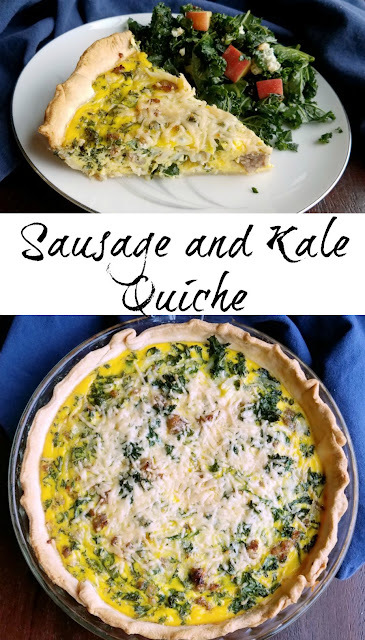 Quiche is one of my faves...I can't wait to try it with kale!!! I love this idea for a quiche! A quick and easy dinner. I love quiche. The sausage is a nice addition. It sounds like it was a hit with your hubby. We actually like breakfast recipes any time of day so this is a great recipe for us. This quiche looks so delicious! Love that you can eat it for breakfast, lunch or dinner. Thanks so much for sharing with us at the Whimsical Wednesdays Link Party! Me too, versatile and delicious is always good. Thank you! ummm... Quiche! one of the only ways I am willing to eat eggs!! yum! You don't like eggs?! Oh my! This quiche is definitely a good way to have them either way.